Head over to the Columbia West Center and check out Mattress World Northwest’s newest location in Scappoose. We’re the place in the Portland area to find the best mattress prices. 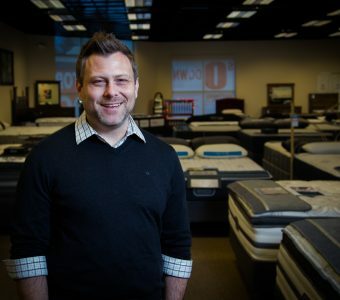 With a dozen locations – including our large Scappoose showroom – and thousands of options from the most respected mattress manufacturers in the business, we know we can help everyone get the sleep they crave and deserve. Talk with our techs about your needs and let us suggest mattress options that are most likely to deliver comfort. We have mattresses of all kinds: latex, organic, memory foam, adjustable bases and more. We have the top producers, including Stearns & Foster, Sealy and Simmons. We customize every shopping experience, ensuring everyone gets the bed that will inspire dreams. Mattress World is about finding the right mattress without stressing over the decision. Talk with one of our specialists about everything from your budget to your physical condition. Get the scoop on how to select a mattress that needs to accommodate two people who have completely different sleep habits. We may have many options in our inventory, but we know how to streamline those options when you’re mattress shopping so that you always choose the right product! It’s the motto espoused by our founder and owner, Sean Hathaway. Sean strives for lower overhead, the best product from the most respected manufacturers and giving every customer value. Stop by our enormous Scappoose showroom today and find special deals on floor models and learn about financing plans.